The Ancient Aliens Season 11 DVD asks, what, if it were true. Join Giorgio Tsoukalos and the other Ancient Astronaut Theorists. 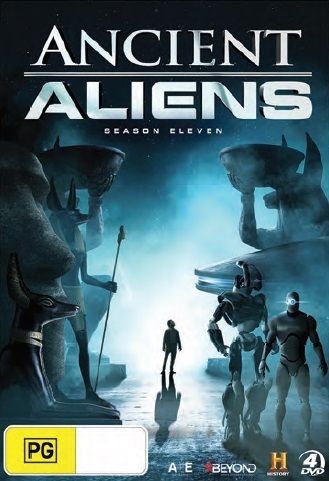 Ancient Aliens Season 11 DVD invites you to explore the staggering and extraordinary evidence of extra-terrestiral presence on Earth. From mysterious codes in the desert to hidden messages in Leonardo Da Vinci's artworks, clues of Alien life can be found scattered throughout our history. Discover the inexplicable phenomena of black holes on Earth, Area 52 and hear the first hand stories of those who claim to have been abducted by Alien life forms. Could all of these peculiar events and sightings be coincidence? Or evidence of our deep and ancient connection to extra-terrestrial neighbours? Click the button below to add the Ancient Aliens - Complete Season 11 to your wish list.